Sous vide eggs benedict pizza is a fresh twist on a breakfast classic, using the traditional components, such as Hollandaise Sauce. Instead of poached eggs, we are using eggs cooked in a sous vide bath. Whisk together egg yolks, lemon, salt and pepper in a microwave safe bowl, add the melted butter and blast in the microwave for 15 seconds. Set aside. 1. Set water bath to 167 F, drop in eggs carefully. Cook for 13 minutes, remove. Shock in cold water to stop the cooking. Set aside. While the pizza is baking, place eggs in a bowl with hot water from the tap. We are warming the eggs for the pizza. 1. Place your Baking sheet or pizza pan on the top rack of your oven and pre-heat at 500F. 2. Stretch or roll out your dough to a 12 inch round and place on a lightly dusted pizza pan or baking sheet. 3. Switch your oven to broil. 4. Distribute fresh mozzarellla and 3 slices of pre-cooked Canadian bacon on the top. Cook for 1 minute under the broiler. After 1 minute, open oven and rotate pizza 180 degrees. Continue on broiler for 1 more minute. 5. Switch oven back to bake or convection bake for 2 more minutes, remove. 6. 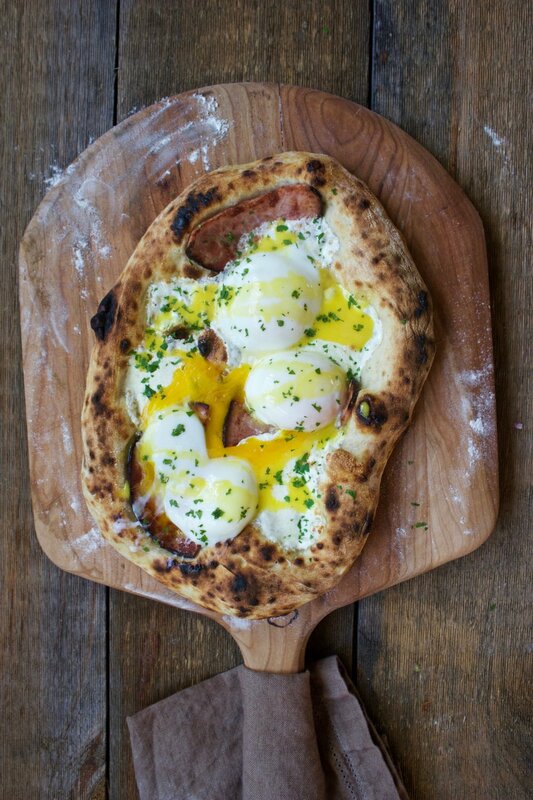 Crack the sous vide eggs in a separate bowl, then place on top of pizza. Try landing it directly on Canadian bacon. Do this for all three eggs. Season with Salt & Pepper. 7. Using a spoon, carefully drizzle Hollandaise Sauce over the eggs.